RCC beams are cast in cement concrete reinforced with steel bars. Beams resist compression and tensile forces and add rigidity to the structure. Beams generally carry vertical gravitational forces but can also be used to carry horizontal loads (i.e., loads due to an earthquake or wind). The loads carried by a beam are transferred to columns, walls, or girders, which then transfer the force to adjacent structural compression members. In light frame construction the joists rest on the beam. In this article, we are going to discuss types of beam construction and RCC design of simply supportedreinforced beam. A singly reinforced beam is a beam provided with longitudinal reinforcement in the tension zone only. Compressive forces are handled by the concrete in the beam. Beams reinforced with steel in compression and tension zones are called doubly reinforced beams. 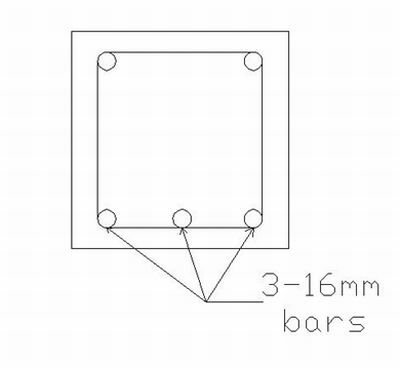 This type of beam will be found necessary when due to head room consideration or architectural consideration the depth of the beam is restricted. The beam with its limited depth, if reinforced on the tension side only, may not have enough moment of resistance, to resist the bending moment. By increasing the quantity of steel in the tension zone, the moment of resistance cannot be increased indefinitely. Usually, the moment of resistance can be increased by not more than 25% over the balanced moment of resistance, by making the beam over-reinforced on the tension side. Hence, in order to further increase the moment of resistance of a beam section of unlimited dimensions, a doubly reinforced beam is provided. The external live loads may alternate i.e. may occur on either face of the member. A pile may be lifted in such a manner that the tension and compression zones may alternate. The loading may be eccentric and the eccentricity of the load may change from one side of the axis to another side. The member may be subjected to a shock or impact or accidental lateral thrust. If factored moment Mu > Mulim, then doubly reinforced beam is required to be designed for additional moment. how ductile failure is ensured in doubly reinforced rcc beam? There are no thumb rules for calculating the quantity of columns or beams. There is a design procedure that you have to follow in order to design a safe building. Also, you can consult with our structural design experts. can u plz tell me what types of load act on beam & column while designing them and how v can calculate them? Thanks for giving information about Rcc Beam design..
for short span 14’6” ( clear ) and 15’6” long span . I know about this type of design but this time due to confusion please guide me. sir,i want to some question that when we done the select the singly reinforced beam than we make the four steel bar and on these beam provided the compression zone and the tension zone .sir please tell me that when very load come on the load than it will be felldown. I want to study detail design calculation of a building with simple drawing.Can you help me from this site or other ways,please. I am not very familiar with ACI 318-05 code. This design theory is based on Indian Standard code (IS-456-2000). But the IS code has been updated as per the standards that are recommended in the ACI 318-05 code. Your site is very helpful for all civil engineers. Where can I able to get M30 grade concrete compressive strength test for corrosion damage. For example, an experiment which someone might have carried out for a particular type of beam section. The first set of specimens shows results for what is the strength initially (uncorroded). The second set of specimen shows what is its strength after some corrosion. The next set of specimen shows strength for totally depleted concrete cover. The final set specimens show results on section strength based on reduced bar diameter. how to rehabilitate the RCC structure ? pls post about the design of shear reinforcement in addition to above desin data…………..
thanks, it was nice to revisit the tecnicalities of designs of stucture after long time, being civil engineers we often tend to forget the basics due to the practice which go arround. looking forward for more. please add problems of design of RC beams and slabs as per IS 456:2000. The process of design in detail with diagrams. We will see to it that problems for design of RCC beams are put up on site. Thank you for your feedback. i like the concept………………….its easy to understand……….!!!!!! I am planning to build my house in which ,I need a column and beam design,which can support the slab spread over about 18 feet,also I like to use only two columns which starts from 1st feet and another in 18th feet,the beams in between this columns has been killing my mind,need help. This house will be ground +2 floors. There is some good news I would like to share with you. This will ease your problems with regards to Structural design. Civil Projects Online has officially launched Architectural and Structural Design Services. You can also get an expert advise on the existing structural design of your building. hey iwant to know about max tensile load on a singly reinforced beam? hey i want to know about charectristic strength of hollow concrete any one know plz tell me..? The average compressive strength of a hollow concrete block is 5N/mm2. very nicely dealt with re design of doubly reinforced beam…..but steel beam theory also is a mode where steel area in tension zone is equal to that in compression zone …otherwise we have take moment of the areas with respect to NA which may shift up or down depending on over or under reinforced design… am i right ..pl post reply for further knowledge..
sir, i started new construction. site dimensions are 18?x36? having east facing. i need the formula for column and beam designing. also need the formula between two column. Please consult a qualified engineer or architect for this. He or she can help you in good planning, optimum use of natural resources, proper column placement, structural design, which will ultimately save you tension and money. You can contact Architect and Engineer Javed Kachchhi. He is a renowned specialist in the field. Check it out. Looking for a structural design of multistory building, covered area 450 sq. feet (15′ x 30′). sir, i started new construction. site dimensions are 18’x36′ having east facing. i need the formula for column and beam designing. also need the formula between two column. sir,we have started a excavation of earth for new construction of house.west facing house.i need help how to design a two way slab for 3 floor residential building.site dimension(w 15’x48′). please send step by step procedure of rcc design of footing ,column,beam,slab for residential building with example and also designing formula sheet. please send step by step procedure of rcc design residential building with example and also designing formula sheet. can u pls send me ” what are the tips and conditions (limitations) used in the designs of rcc structural elements like beams, columns, slabs, footings and also give the step by step designing procedure of these elemant with an suitable example as per IS:456-2000”. It is very usefull to the learned students and teaches too.pl.updadate time to time and give more examples for practice. can u pls send me ” what are the tips and conditions (limitations) used in the designs of rcc structural elements like beams, columns, slabs, footings etc”. And also the procedure steps as per codal of IS: 456-2000. Is this design based on ACI 318-05 code? i need all civil engineering projects so it is best web site civil engineer. If the stress in steel in the compression zone is less than yield value, SP 16 gives a table relating strain and stresses. Is there an expression relating that strain and the corresponding stresses? Surely the values have been obtained from the accompanying graph in SP 16. From an examination point of view, how to get that table by calculation?